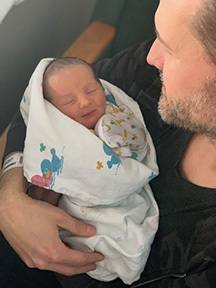 Adelia “Addie” Eve Redmon, a precious baby girl was born on Monday, April 8 to proud parents Anna Redmon and Big Daddy Weave guitarist and producer Jeremy Redmon. Addie, like the message in Big Daddy Weave’s newest song “Alive,” is a symbol of a new season ahead. Welcome to the Big Daddy Weave family, Addie! May the Lord bless you and keep you always.